20,600 TEUs capacity, or 123 kilometers of containers. a system for the treatment of ballast water by filters and UV lamps, allowing to reject to the sea a cleared water, without living organism capable of impacting marine biodiversity. 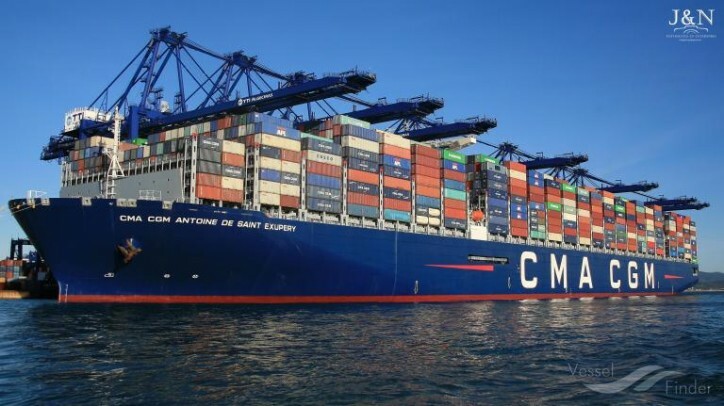 The CMA CGM ANTOINE DE SAINT EXUPERY joins a line of containerships bearing the name of some of France’s greatest writers and pioneers like the CMA CGM JULES VERNE, named after another great writer who was passionate about travels and adventures, or the CMA CGM BOUGAINVILLE which was inaugurated in 2015. By naming its flagship CMA CGM ANTOINE DE SAINT EXUPERY, the Group pays tribute to the globally known Aéropostale pioneer, writer and poet.